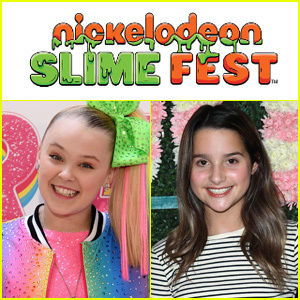 Nickelodeon Announces SlimeFest 2019 Featuring JoJo Siwa & Annie LeBlanc! | Nickelodeon, SlimeFest, SlimeFest 2019 | Just Jared Jr.
Nickelodeon Announces SlimeFest 2019 Featuring JoJo Siwa & Annie LeBlanc! Nickelodeon’s SlimeFest is going to be bigger and better than ever! The network just announced this year’s two-day family-friendly music festival, set to take place June 8th and 9th at Huntington Bank Pavilion at Northerly Island in Chicago, Ill. The epic event will feature performances from JoJo Siwa as well as Pitbull, Bebe Rexha and The Masked Singer‘s T-Pain. Nick stars including Annie LeBlanc, Knight Squad‘s Owen Joyner and Daniella Perkins, Henry Danger‘s Ella Anderson and Riele Downs and Scarlet Spencer and Dallas Dupree Young from Cousins For Life will also be in attendance. SlimeFest will of course include tons of opportunities to be slimed like in the Slime Maze and Slime Central, where over 30 people can get slimed simultaneously! Tickets to SlimeFest will go on sale on March 29th at 10 AM CT.